In stock -This product will ship today if ordered within the next 2 hours and 42 minutes. 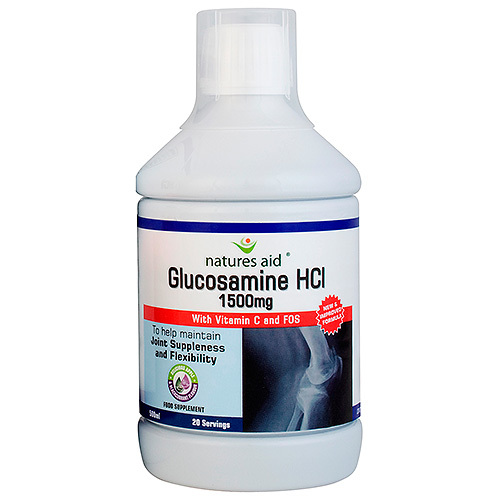 Natures Aid Glucosamine HCl contains 1500mg of glucosamine per use which may help to maintain joint suppleness and flexibility. Glucosamine Hydrochloride (product of crustaceans - SALT FREE), Blackcurrent Concentrate, Apple Concentrate, Natural Colouring (Anthocyanins), Preservative (Citric Acid), Fructo Oligo-saccharides - (FOS), Preservative (Potassium Sorbate), Vitamin C (as Ascorbic Acid). Mix 1 tablespoon (15ml) to four parts water and take once a day. 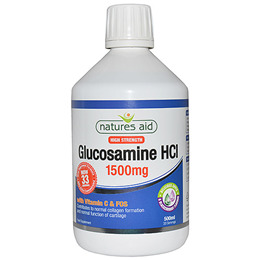 Below are reviews of Natures Aid Glucosamine HCl - Joint Health - 500ml by bodykind customers. If you have tried this product we'd love to hear what you think so please leave a review. I've used this products for a couple of years now and my knees certainly know when I've stopped using it! I personally find this much more effective than the tablets.